NEW DELHI: I recently came to India to deliver lectures as an honorary professor at the University of Delhi and have met with a cross-section of faculty, students, media, experts working in think tanks, and members of the public. While here, I have sensed a rare consensus among foreign policy wonks about the current state of India-U.S. relations and its future trajectory: the relationship is quite positive. From a period of uncertainty and the relations between the two countries being occasionally on a kind of roller-coaster, a significant improvement has occurred during the last decade, perhaps due to the convergence of not simply values but also mutual interests. Both countries have often touted pride in democracy and fair elections — India being the biggest democracy and America the oldest. Beyond faith in freedom of expression and strict adherence to human dignity, today’s emphasis is on pragmatism and political, economic and security interests. Asymmetry of power between these countries notwithstanding, there is the drumbeat of strategic partnership. President Donald Trump has called Prime Minister Narendra Modi a “friend,” and on the sidelines of the recent ASEAN summit in the Philippines, Modi thanked Trump for speaking about India “highly” on his trips and said that relations between these two countries can rise beyond bilateral ties and “we can work for the future of Asia and the world.” Officials of India, the U.S., Japan and Australia also held talks to give shape to the quadrilateral alliance to keep the Indo-Pacific region free, open, and inclusive, and apparently to counter China’s rise. This change from Asia-Pacific to Indo-Pacific is to indicate the special role of India in the region. Unlike in the past, no longer does the U.S. equate India with Pakistan when regional issues are discussed. After the recent blast that rocked Kabul, Afghanistan, Trump asked countries to take “action against the Taliban and the terrorist infrastructure that supports them.” Last month, the U.S. suspended $255 million in military aid to Pakistan, accusing the country of “lies and deceit” and providing “safe haven” to terrorists in return for $33 billion U.S. aid over the last 15 years. During this past year, Trump has reversed every major Obama policy, but there is no change in the continuing productive and stable working relationship between India and the United States. In addition to Modi and Trump’s meetings and several telephone conversations, several U.S. officials, including secretaries of State and Defense, have visited India. Similarly, Indian officials have visited the U.S. to exchange views and to work on defense, energy and economic issues. There is alignment between the two countries on several issues pertaining to China, such as its One Belt One Road plan and the China-Pakistan economic corridor running through Pakistani-occupied Kashmir. The U.S. and India are now engaged in joint naval and army exercises. On economic relations, along with sales in U.S. civil aviation and military equipment, now crude oil is added, as well. India is the biggest growing market for Americans and the U.S. remains a dominant investment partner for India. The new American ambassador to India, Kenneth Juster, pronounced in his first speech that Trump’s “America First” and Modi’s “Make in India” are not incompatible. He said that India could be the hub for U.S. businesses in the region, with trade already increasing from $20 billion in 2001 to $115 billion in 2016. And he suggested that India could join the 48-member Nuclear Suppliers group, as it has sought for some time. He suggested an energy partnership in all forms of energy, infrastructure and technology. He also said that India should play a major role in post-conflict reconstruction of Afghanistan and that the U.S., working with multilateral development banks, could help India finance infrastructure projects. 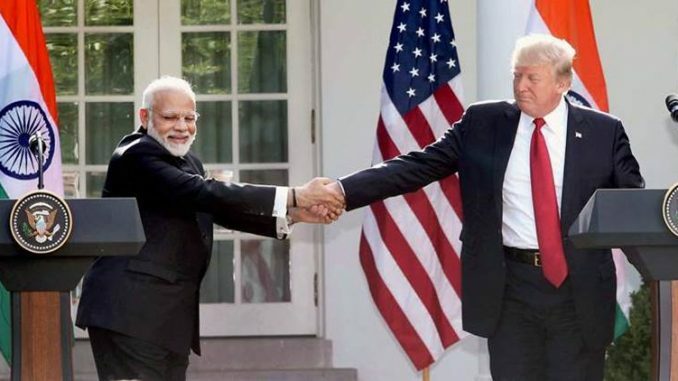 The U.S. needs India and India needs the U.S. Common interests between these two countries far outweigh the different geopolitical decisions they take, and hence the momentum should continue in a positive direction. Ved Nanda is Evans University Professor and director of the Ved Nanda Center for International and Comparative Law at the University of Denver Sturm College of Law.